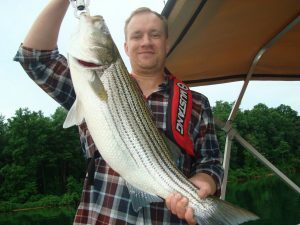 Raystown Lake Fishing Charter - Book Yours Now! Trips can be booked by phone or e-mail. Once a trip is booked a $50 deposit is required within 7 days. I will phone or e-mail you when your deposit is received. Sorry, no refunds unless I cancel ( severe weather etc. ) I also recommend you book your trip as early as possible. If you have any other questions concerning your trip please contact me and I’ll be happy to answer them. The charter boat- 22′ Princecraft deck boat with bimini top & side curtains for sun & rain protection. The bait- alewife or shad which I net from the lake and occasionally trout or lures • All of the tackle- rods, reels, etc., also a large fish cooler with plenty of ice. All of my equipment is top of the line. I also offer expert fishing tips for those anglers looking for an edge. 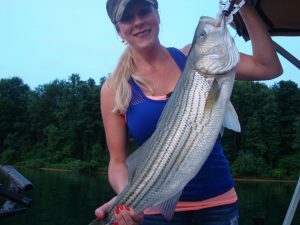 Copyright © 2019 Striper Lore Guide Service on Raystown Lake, PA. All Rights Reserved.